Our all-natural dog biscuits are truly world-class...but it all started with a big idea from a couple of dog-lovers on a farm in North Otago, New Zealand. Our journey started back in 1992. As farmers with irrigation our wish was to utilize the water more efficiently. Our mission statement was (and is) to grow a naturally healthy crop to improve human health - and now, canine health. Finally, after years of research and trialling, we came across Montmorency tart cherries. As a nation we are only just starting to learn more about this wonderful fruit and the health benefits it offers. In Europe and America where it is part of their staple diet, they have enjoyed the benefits for centuries. It is even referred to as “the healing fruit”. Whilst travelling in America we witnessed how dog lovers were using tart cherries as a treat for their dogs. Our challenge was to figure out a way to pass on the health benefits to our four legged buddies. That’s where the fun began. While receiving expert nutritional advice from an animal nutritionalist, we started mixing and baking in our farm kitchen and testing on available dogs and breeds. As New Zealand’s only commercial Montmorency tart cherry orchard, we have access to the best quality fruit, straight from our farm. Our human-grade ingredients are totally natural, with no nasty preservatives or added salt or flavours. 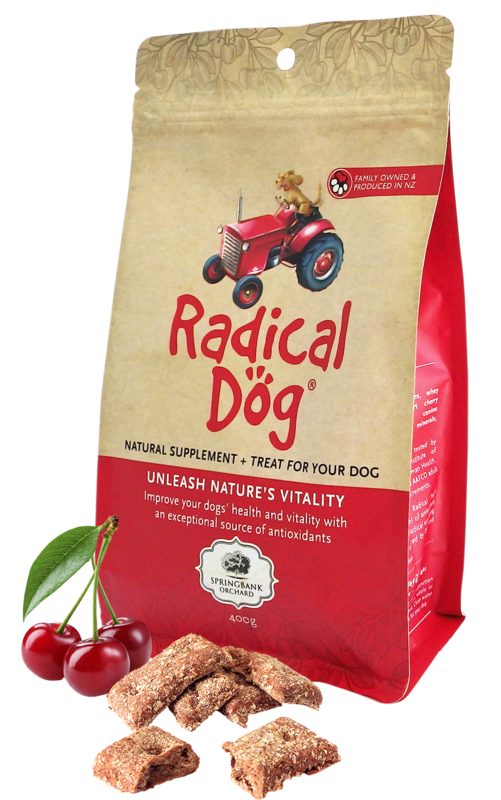 Plus, there are no animal or cereal by-products included, ensuring you’re dog is getting the purest form of tart cherry goodness. Finally, after four years of research and development we have produced a dog biscuit of the highest standard, which we proudly stand by and are privileged to share with other dog lovers. From where I’m sitting... it’s been a bumpy ride. I’m not a young dog, but my tart cherry scoffing habit has wound back the clock. I’ve got my mojo back, my joints “glide” like they used to and my coat is the envy of the neighbourhood. Great for a dog like me that likes to be active and enjoy life. Now my owners, John and Maureen already knew how great our tart cherries were - www.cherryvite.co.nz - but it took me to show them that they're good for dogs too. The reason is that Springbank Farm’s tart cherries are especially high in antioxidants and fighting off free radicals, a fact that has been backed up by the sciencey folk at Massey University. So just a couple a day with my tucker or as a treat when I’ve been good all it takes for your dog to have a little extra zing. I hope you love them as much as I do!